When I re-located from Sydney’s Bondi Beach to the Coffs Coast two years ago, Bellingen was my cultural life-saver. It had almost everything that I had missed about the big smoke; great live music, kundalini yoga classes, colon hydrotherapy, organic baked goods, great coffee (albeit sans best buddies) with an awesome, small town community vibe. As I turn inland towards Bellingen, leaving the sparkling waters of the coast behind, the road winds through the sub-tropical hinterland and enters a picturesque valley. Located half way between Sydney and Brisbane, the Bellingen Valley is home to a vibrant, alternative lifestyle community, a few well-known Australians and loads of amazing wildlife and natural beauty. It is also known as Byron Bay’s little sister, a more timeless, authentic version in my book. 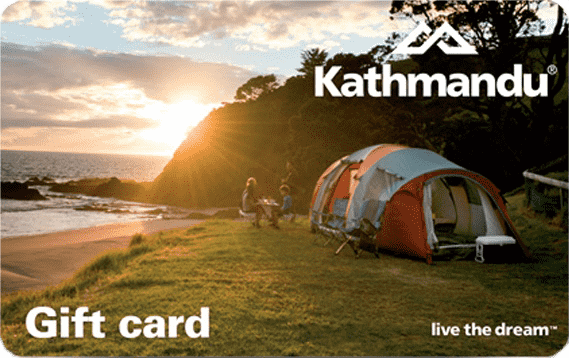 I gaze at contented cows as they graze the lush farmland pastures that border pristine rivers, which unwind into the magnificent mountains and which hug this historic hill town – ‘picture postcard’ pretty much sums it up. However, it didn’t always look like this. In days gone by, thick forests of red cedars and tallowwood once covered these smooth, emerald hills before the arrival of Europeans timber in 1843. They were cutting down trees as fast as possible and transporting them by river and sea to Sydney and the world markets. Timber was a much in-demand commodity, especially the ‘red gold’ cedars, which had a dramatic impact on the landscape and the local Gumbayngirr tribe. 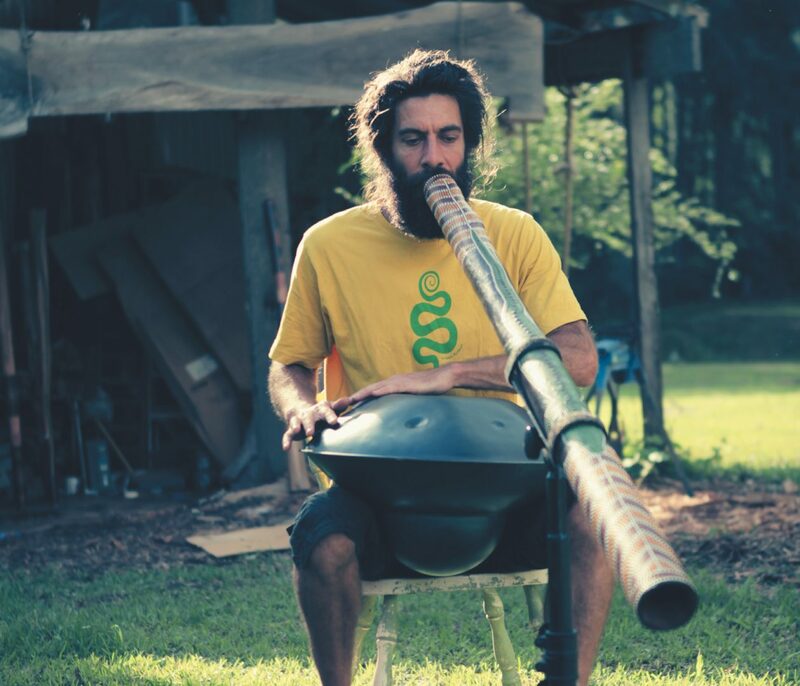 This history of the bush is repeated across most of our country and it is artists such as Bellingen local Jesse Lethbridge, a didgeridoo-maker who are re-telling the story of the bush. We can often forget how landscapes are cleared to make way for farmland, however if you take the incredibly scenic Waterfall Way, west towards Dorrigo National Park, you will get a peek into an ancient prehuman world. The Gondwana World Heritage area is the most extensive strip of diverse rainforest anywhere on earth and a stunning record of life on our planet. A must-see if you love being immersed in the natural world. ‘Clean water’ is the meaning of ‘Billingen’ in the local indigenous Gumbaynggir language and it surprisingly still rings true today, thanks to the efforts of the Bellingen Environment Centre and the can-do spirit of local community. Bellingen folk are an eclectic bunch, boasting the highest concentration of creatives on the Coffs Coast and the most likely to volunteer in some capacity. Architects, designers, artists and musicians from all over have chosen this magical valley to work, create, play and raise their families, as much for its natural beauty as the colourful community life. As I drive along the sweeping ridgeline to the home of one Bellingen’s unique artists, I spy many beautiful timber homes surrounded by lush gardens in which I could easily see myself living (or maybe an artistic retreat weekend at least!). Jesse Lethbridge, digeridoomaker and musician, devotes his time in this valley to crafting, playing and composing for this iconic instrument. Beginning to play the didgeridoo (or Yidaki as it is known in north-east Arnhem land) in 1998, Jesse has journeyed many times through the heartland of Australia to deepen a connection with the yidaki and the indigenous family who carry the legacy of being the traditional crafters, healers and musicians of their tribe. It was to have a profound effect on the direction of his life and that of his future family. Djalu Gurruwiwi is the elder from northeast Arnhem Land that ‘adopted’ Jesse, teaching him the music and sacred meanings of their ancient ways. 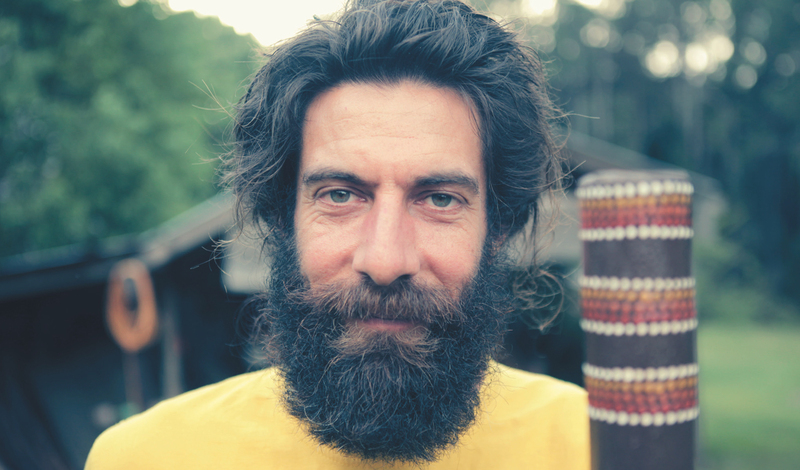 A special bond formed which sparked Jesse’s passion to continue learning, performing and travelling with the yidaki throughout the world, deepening his sense of self and appreciation of other cultures. Raising his two children with his partner on acreage that also doubles as Jesse’s craft workshop, has allowed Jesse to follow his bliss and musical pathway. Bringing together his other musical passions for 6 and 12 string guitars, mandolin, percussion and Native American flute, Jesse creates uniquely tribal music to which we could blissfully relax or let loose and dance.